Inder Loves Folk Art: Vintage Maggie. No, no, Maggie is not vintage. Hardly. Nor is this dress, which I made a couple weeks ago, to celebrate Maggie being "back to school." But the pattern I used to make the dress is "vintage" (at least by this definition) and my choice of fabrics and rick rack pretty much scream "vintage" don't they? And "Vintage Maggie" has a nice ring to it. 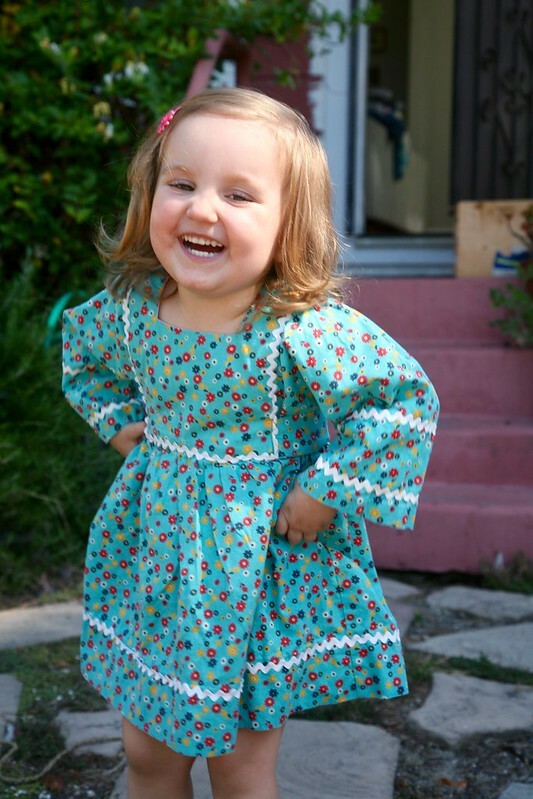 I've had this pattern from the early 1970s in my stash for a few years, but Maggie only recently grew into size 2 (at age 3 and some months! ), so I pulled it out on a recent browse/purge of my patterns. Maggie is always pestering me for new dresses these days (my heart!! ), so at some point I pulled this down and showed to it to her. To my great surprise, Maggie pointed to Version 2, the little blue dress, and said "I want a blue dress like that!" Now, as you know, Maggie's been on an all pink all the time kick for about a year now. I've worked with her and she has accepted a few garments that are not bright pink head to toe, but most of my recent makes for Maggie are bright pink dresses! Maggie has actually been saying "I hate blue!" lately, although I'm not sure she knows what it means. So when Maggie told me she wanted a blue dress, you could've knocked me over with a feather. Of course I wanted to oblige her and encourage this adventurous foray into colors that are not pink, but I was just really worried she might change her mind! I picked this fabric and white rick rack because they were the closest match I had in my stash to the blue dress in the pattern illustration. The blue calico is from JoAnns years ago - I bought it before Maggie went on her pink kick with the idea of making her something with it, and it had sat ever since. It has a cool, funky, retro vibe, for sure. I have to say, the rick rack pushes this dress completely over the top, almost into "costumey ridiculous," but it's really fun and I love it anyway. If you can't wear something over-the-top and frou-frou when you're three, when can you? And I'm pleased as punch to say that she did not change her mind! So it may be ridiculous and over-the-top, but she likes it and it's freaking adorable on, and it's blue, so I consider this an unmitigated win! 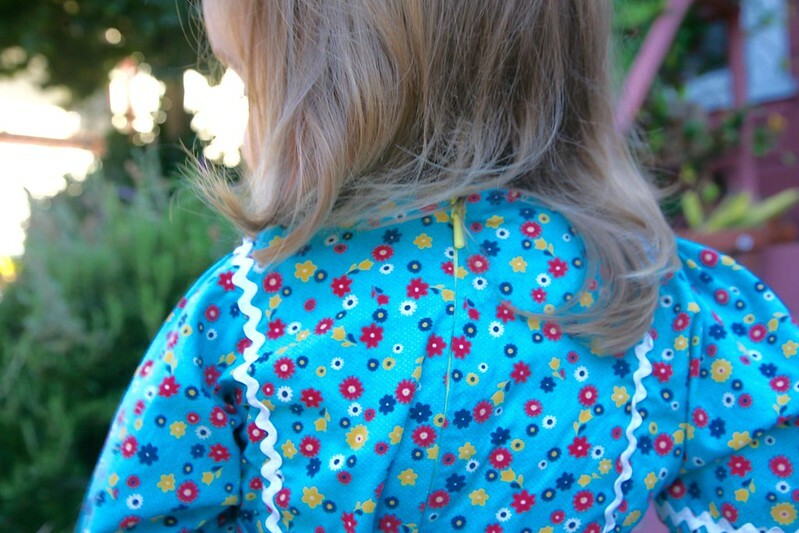 As far as construction, this is a pretty simple little dress, with a lined yoke and a zipper in the back. 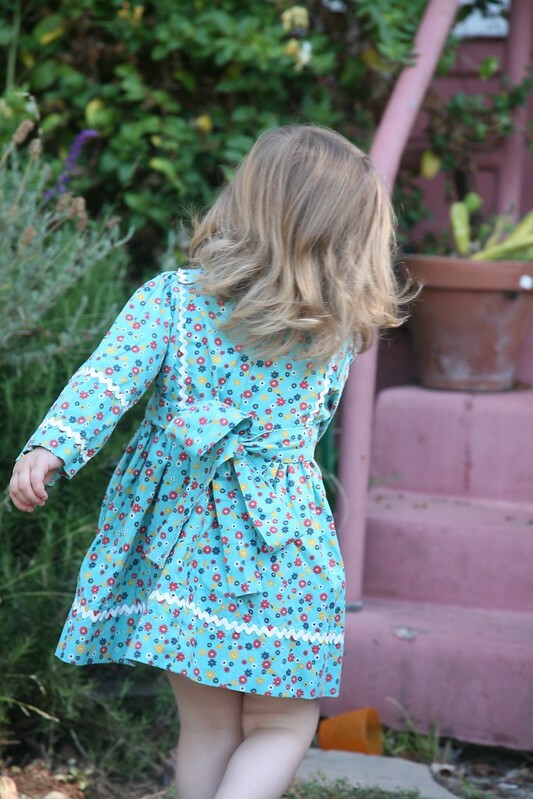 As was the fashion in the early 70s, the dress is pretty short, but I decided not to lengthen it, since it's cute and I anticipate Maggie will mostly wear the dress with leggings this autumn. I could even see making this style in a shorter length as a tunic. The pattern provides little guidance on seam finishing and contemplates that linings will be tacked down and hems finished by hand. The sash is simply tacked to the side rather than buried in the yoke seam as I think it ought to be. In my experience, this is pretty standard for patterns from this era. In the case of this dress, I did do things a little differently, hemming and attaching the rick-rack by machine (sewing the rick-rack onto the front yoke was the hardest part of this dress, actually, just because it was difficult to maneuver my machine over a mostly-completed dress), and inserting an invisible zipper instead of a centered zip. I used the Hanami Dress instructions for inserting an invisible zipper with lining, and, similar to that pattern, let the zipper end at the gathered waistline. This worked fine, and there is still plenty of room to pull it over Maggie's head, but for an older girl, I might insert a longer zipper to allow her to step into it. I chose a yellow zipper from my stash so there is a peak of yellow at the zipper pull. This dress is a lot like the Oliver + s "Hide and Seek" pattern, isn't it? 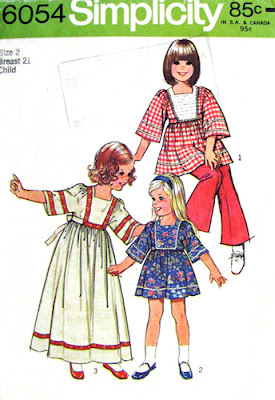 This pattern is definitely a touch more "retro" and less modern and tasteful than the Hide and Seek dress. The sash and all around gathering make it a little more "little girl." Even though I have the Hide and Seek pattern and haven't made it yet, I really wanted to use this vintage pattern at least once, while it fits Mags. But I think, without the rick-rack and in a plainer fabric, this dress pattern could be a lot less costumey and more everyday. 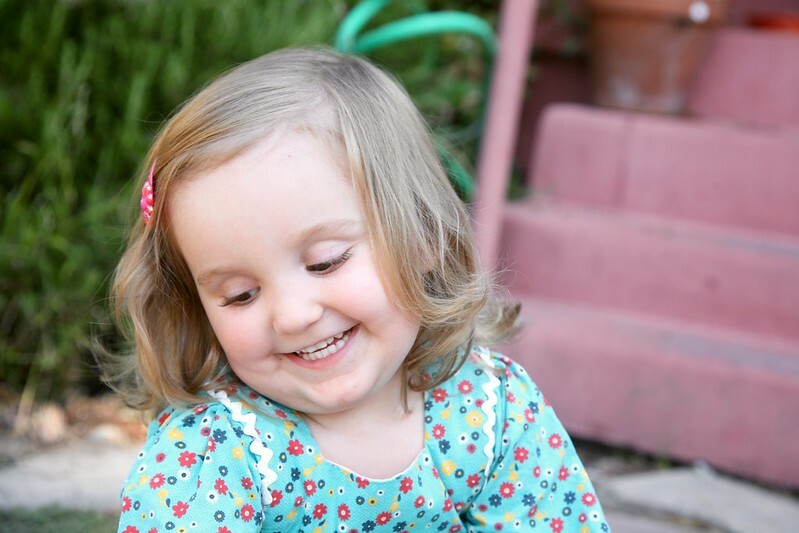 Did you see that Alicia Paulson made this same pattern for her daughter, using a mix of prints? If I seen that version before I started mine, I might have copied her! And hey, there is still time to make more of these, since the pattern has plenty of ease for Maggie and will probably fit her for a while. I am annoyed that Flickr is watermarking my photos again and I haven't figured out if there is a way to post straight from Flickr without the watermark? Anyone figure that out? If so, please tell me how to do it. I really like using Flickr because it allows me to draft a blog post from any computer or device, rather than limiting me to the computer that has my photographs on it, but the watermark is super annoying. I know the trend recently has been away from Flickr (probably because they keep doing these blog-unfriendly things like putting watermarks on our photos) - is there another internet host that folks are using for photos? Oh my darling Maggie. Everyone agrees you have the best smile in the whole wide world. Your entire face smiles. People stop in the street to smile back at you when you flash this grin at them, because it just cannot be ignored! You spread happiness and delight everywhere you go. My lovely Margaret Joy. I will be back tomorrow with my contribution to Imagine Gnat's Selfish Sewing Week, so stay tuned! I'm a confirmed ric rac hater, but Maggie is the one who could sway me! She is super cute in this dress. It's cute at the short length and the ties def give it a retro vibe. I think this dress is so adorable! I love all of the ric rac-- it is such a fun touch and definitely reminds me of clothes I wore growing up in the 70s. I'm not sure any of my clothes were this nice shade of blue, though. I feel like everything was some variety of orange or brown. I have been a little dissatisfied with flickr lately, too. I was investigating a little this weekend and came across Photobucket. I may give that a try and see how I like it. This is ridiculously cute. The dress and the smile! Love those sleeves. It's the sweetest of blue dresses! 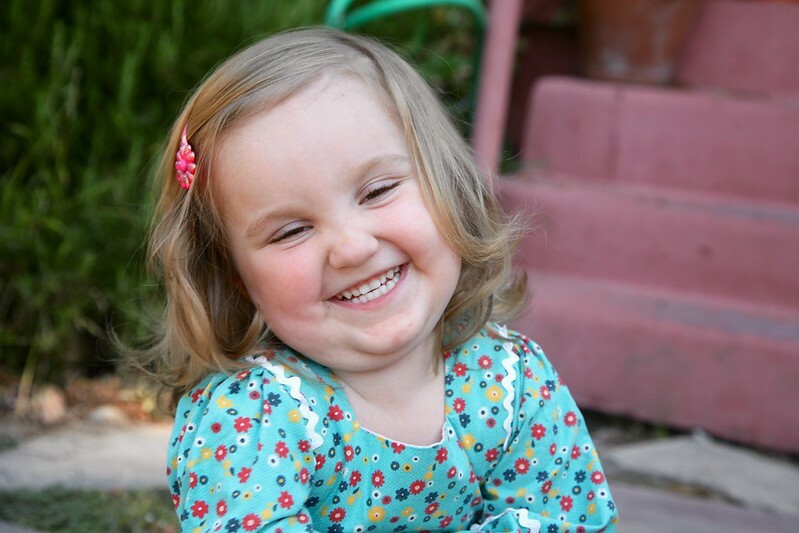 And her smiles- the best! I don't know how I missed this, but ack, is it adorable or what?? I love it, completely! Maggie looks so delighted with it; I hope she continues to be so!